Life within the Qrendi confines has been recorded as far back as the early or later Pleistocene times (circa 2.588 million to 11.700 years ago) and where dwarf elephants, hippopotami, bears, stags, foxes and giant dormouse fossilised bones had been excavated from the “bones caves” in 1858, from the nearby hard coralline limestone quarries. Neolithic ruins at Hagar Qim, Mnajdra and Misrah is-Sinjura complement Malta’s largest free-standing temples, Phoenician and Palo Christian rock tombs and catacombs are also located in Qrendi. Neolithic Temples at Hagar Qim and the Mnajdra, the Blue Grotto sea caves and grottos, the Wied iz-Zurrieq coastal harbour, the Octagonal Tower, the Grandmaster De Redin and Lascaris Coastal Towers, The Qrendi Parish Church, The Madonna tal-Hniena Sanctuary, wayside chapels, palaces attributed to the Knights of Malta, and the Gnien tal-Kmand gardens are all worthy attractions located in Qrendi. The confirmation of Qrendi as an independent Parish on the 19th February 1618, is celebrated on the first Sunday following the 19th. The celebration of the village feasts of Santa Maria on the 15th August, Our Lady of Lourdes on the first Sunday in July. Also celebrated is the the Potato and Agrarian Festival on the last Sunday in May. The religious feasts of the ascension into heaven of the Blessed Virgin known locally as Santa Marija, and the feasts celebrating the visitation of our Lady of Lourdes are definitely not to the missed. 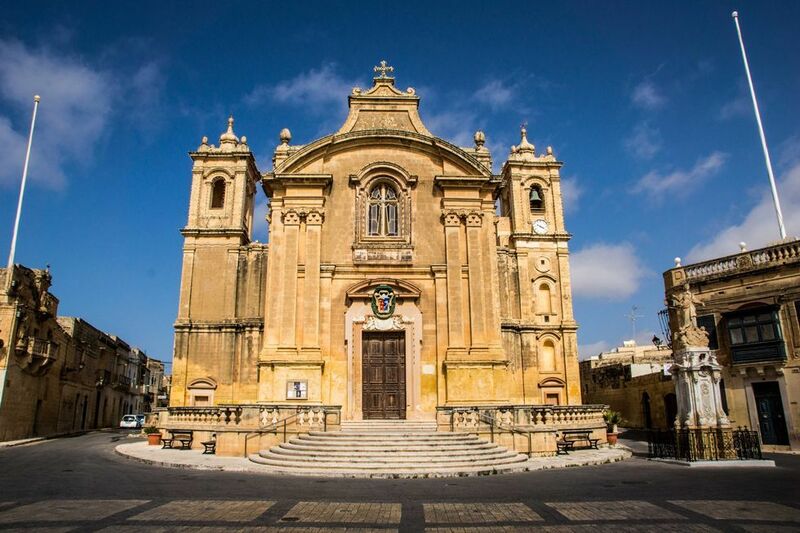 More about the history of Qrendi can be discovered through the Tourism section. Located in the South Eastern Region of Malta, the village of Qrendi has a population of 2773 people. Qrendi is adorned with a country side rich in flora and fauna diversity, with an abundance of Carob trees, potato and onion fields, and the legendary Maqluba doline, where Malta’s national tree, the Sandarac Gum Tree (Gharghar) grows to its heart’s content. 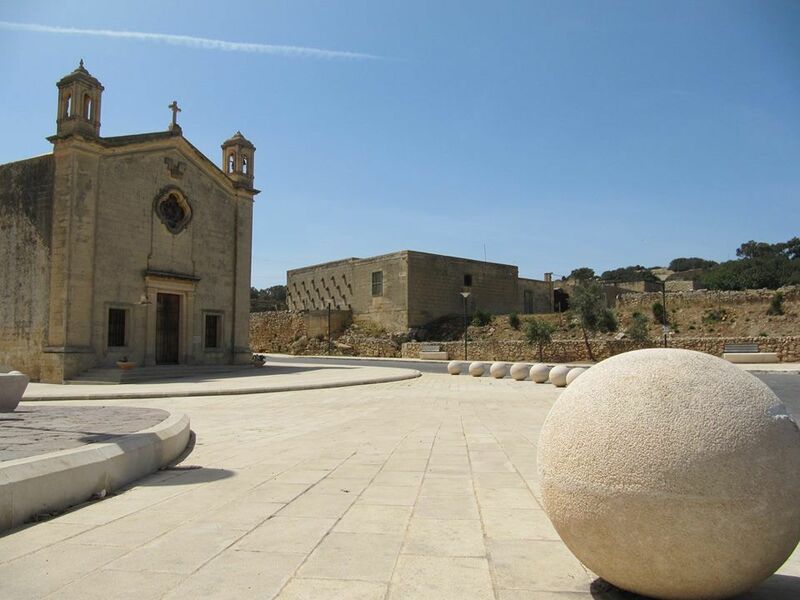 Growing in popularity at Qrendi is the San Mattew tal-Maqluba attraction, as the rich surroundings at San Mattew tal-Maqluba offer a tranquil and relaxing environment, where heritage, beauty, legend, culture and religion intersect. This location is proving of becoming a most popular venue for wedding celebrations. Several Fish restaurants are open daily at Wied iz-Zurrieq, the restaurant at the Neolithic temples complex specialises in traditional Maltese dishes. A restaurant within the Qrendi village Core also offers Maltese food dishes as well as traditional Rabbit dishes. No shopping venues are available locally except for some “family run” food supermarkets, and shops. The village of Żurrieq (ten minute walk away) however offers an open market. Thanks to its large cultural heritage, the village was awarded with the European Union, "European Destination of Excellence" title, which further stimulates its tourism sector. The Guarena Palace, a square-shaped fortress-residence, consists of two storeys with the lower story being much larger than the one above. The entrance is typical of the Maltese houses of the time with its size being relatively small when compared to the palaces or residences of the Order of St John. The Palace’s entrance ceiling is barrel-shaped in which one can find a monumental stone stairway, typical of the palaces of the same era found in Valletta. The stone handrail rests on stone banisters. The upper storey consists of lesser rooms however their doorways are much larger than those found on the first storey. It seems that the idea of the defense of the building was wavered in lieu of comfort as such doorways allowed its rooms to be much cooler in the hot summer months. The upper storey leads into the back gardens where one can admire numerous citrus trees. On top of the second storey one can find a small but significant observation turret possibly to observe any movements from any invaders or corsairs. Situated on top of the “Maqluba” geological feature (the name meaning “overturned” referring to the area), the chapel is a typical wayside chapel, and the second that one visits this attraction, can truly realise the spiritual attributes of the locality. In reality there are two chapels: the smaller and older chapel (on the left) lies on the edge of the sinkhole, and is probably one of the oldest chapels still standing in Malta as built previous to the 16th century as records show that it was already standing in 1574/5. The other and much bigger chapel in size is much used nowadays, was built between 1674 and 1682. The San Mattew tal-Maqluba offers three attractions, namely the Maqluba Doline (Circa 1343), the small San Mattew Chapel (pre1575), and the larger San Mattew Chapel (1682). The Maqluba is renowned for its uniqueness due to its particular landscape, and brings together a blend of religious, historical, cultural, folklore and legendary aspects, with Maltese endemic and indigenous trees and shrubs found growing within the area, termed as a “Special Area of Conservation”, and a “Natura 2000” site. 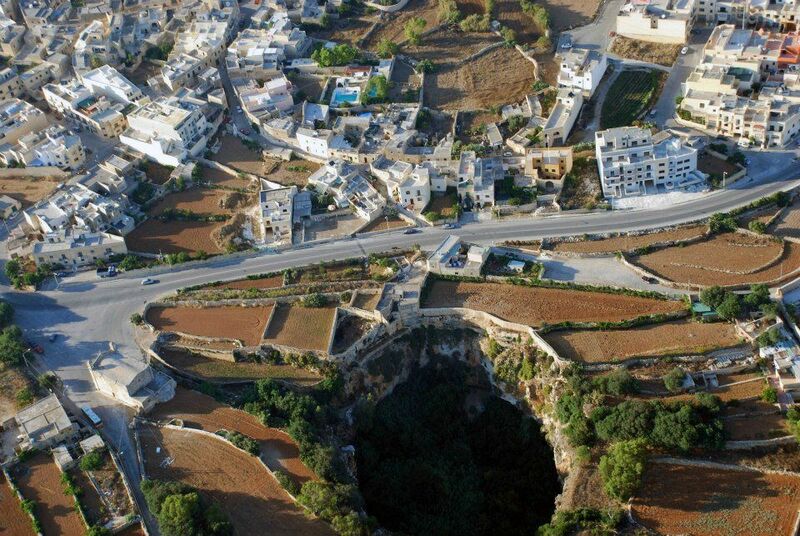 The Maqluba doline or natural sinkhole is a typical natural attraction, and where if one was to venture deeper within, one can see many Carob and Sandarac Gum Trees, amongst other Maltese indigenous and endemic trees and shrubs. The formation of the Maqluba doline is attributed to have happened on the 23rd November 1343 during a violent three day storm or tempest. The San Mattew tal-Maqluba site offers an “all year round” wedding venue where locals and tourists alike choose Malta and specifically the Maqluba site to confirm their wedding vows. Composed of several sea caves caverns, the Blue Grotto (il-Hnejja) is located in the south east coast of Malta, a mere five kilometres away from the small uninhabited islet of Filfla. The location of the cave combined with the sunlight, lead to the water mirroring a myriad shades of blue, and ideal for viewing during the morning. Sea flora and fauna add colour below the waterline with clear and clean waters affording a true and wonderful experience. 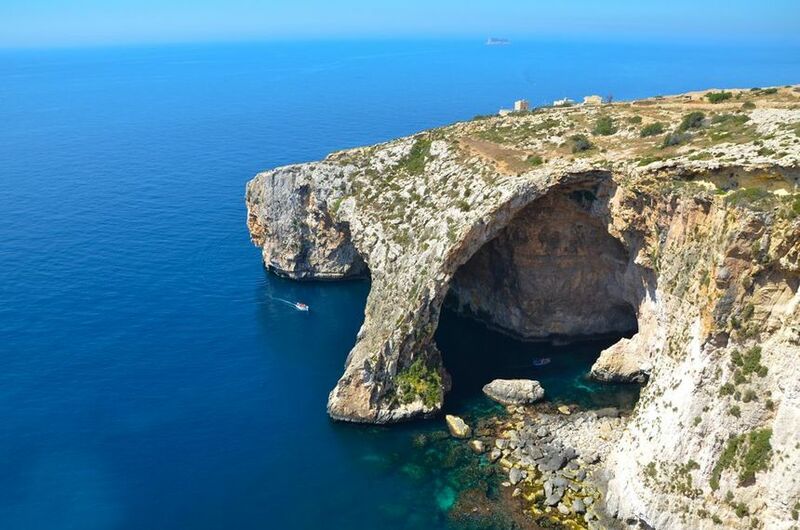 The Blue Grotto a popular destination for tourists visiting the Maltese islands, is best visited aboard the eight passenger boats that embark from the sea port of Wied iz-Zurrieq. Wied iz-Zurrieq has proven to be a most popular underwater diving site due to its various attributes accommodating both the experience and the novice. A site where the wreck of the Um el-Faroud was scuttled thus creating an added attraction and artificial reef. The Chapel of Our Lady of Mercy was built in the thirteenth century when Hal Lew was still part of Zurrieq. 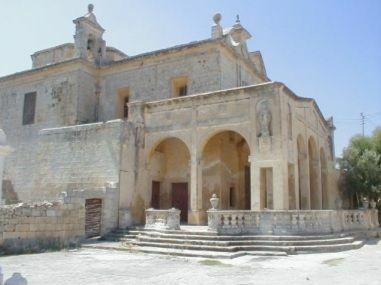 When Żurrieq became a parish, the chapel of Mercy served as vice parish taking care of the spiritual needs of people living in the area. The Chapel, often referred to as Chiesa del la Misericordia, has three altars with staircase. At the entrance of this place of worship one can find wooden chair accessible by ladder. In 1668, a simple but interesting sacristy roof form was added, with decorations engraved in stone. The religious feasts of the ascension into heaven of Santa Marija is a week long festivity, a compilation of religious worship, musical interpretations in the form of band marches and concerts, as well as a two day pyrotechnic manifestation that all help to attract numerous local and foreign visitors to our village. A parish church dressed in all its splendour, streets decorated with banners and fairy lights, and fireworks that illuminate the skies with a magnificent array of colours synchronised with sound, has seen the two Qrendi societies being crowned as Malta Pyrotechnic champions in all three categories, those of ground, aerial as well as the International categories, in recognition of their skills and talents. The eve and day of the feasts also see a combination of the ground “Catherine wheel” pyrotechnics synchronised with light, sound and classical music as well as aerial manifestations. 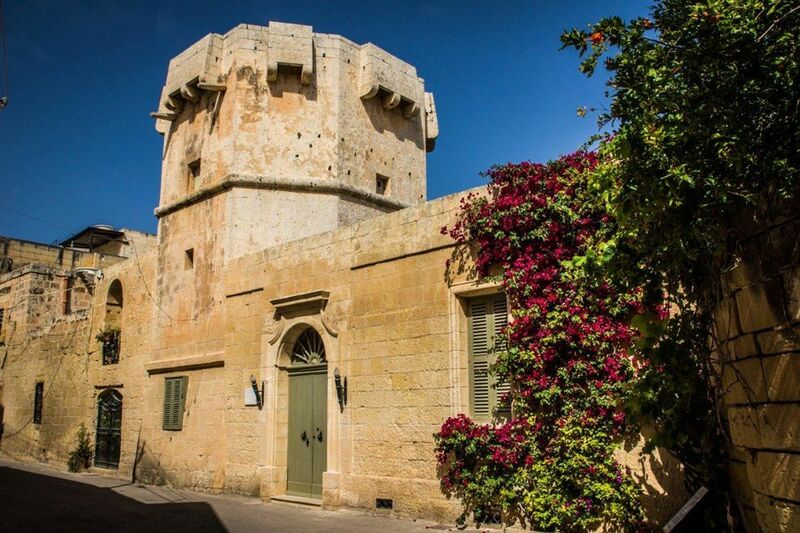 One of a kind in Malta, the Cavalier Tower is a former home to the Master of the Knights of St. John of Jerusalem Order. The tower has an octagonal shape with four walls 3.7 meters thick, while the rest of the walls are 2.1 meters thick. It consists of three floors; internal stone connecting the basement to the first floor. Door on the first floor takes you on the roof of a room adjacent to the tower. Access to the rest of the floors is only through a hatch reachable by ladder and assures a better defence of the tower. The tower also has right drop balconies (Balconies without floors), whereby hot water and stones could be dropped on any attackers as a means of defence. The temple of Ħaġar Qim located not more than 2km south-west of the village of Qrendi, stands on a hilltop overlooking the sea and the islet of Fifla. At the bottom of the hill, and only 500m away, lies another remarkable temple site that of Mnajdra found above the Southern cliffs. The surrounding landscape is typical of Mediterranean garigue and spectacular in its starkness and isolation. 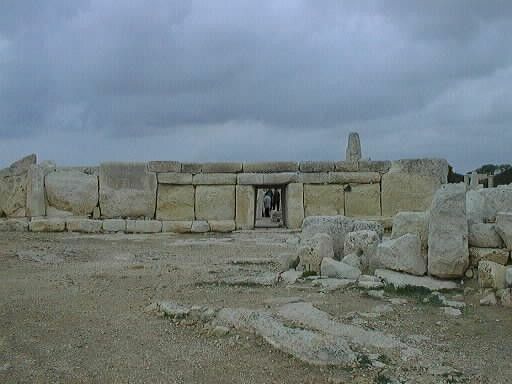 First excavated in 1839, the remains suggest a date between 3600 – 3200 BC, a period known as the Ġgantija phase in Maltese prehistory. Ħaġar Qim was in fact never completely buried as the tallest stones, remained exposed and featured in 18th and 19th century etchings. The site consists of a central building and the remains of at least two more structures. The large forecourt and the monumental facade of the central structure follow the pattern typical of Maltese Prehistoric Temples. Along the external wall one may find some of the largest megaliths used in the building of these structures, such as a 5.2m high stone and a huge megalith estimated to weigh close to 20 tonnes. Qrendi was awarded the European Destination of Excellence Network title (Tangible Cultural Asset Award), in recognition of its San Mattew tal-Maqluba spiritual surrounds. 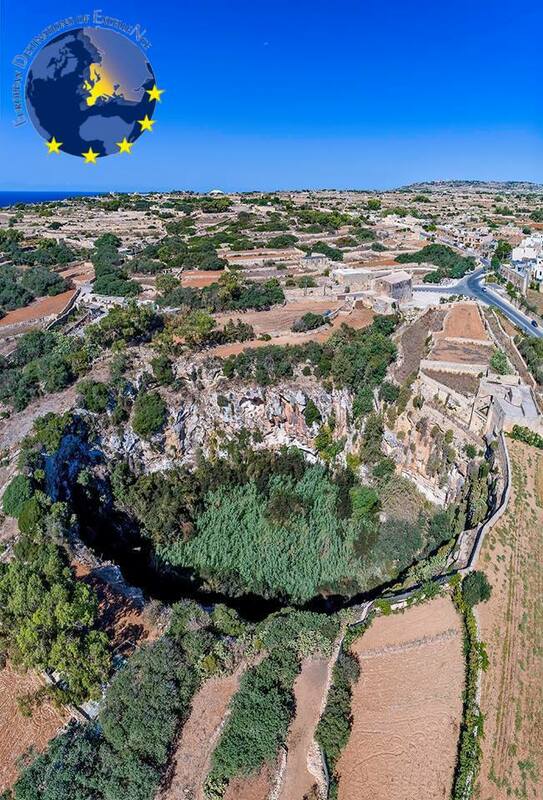 The “Malta Goes Rural” project now granted Qrendi village and locality with a national and international “European Destinations of Excellence” status in 2016, within the European Union member states. The Maqluba doline, the San Mattew chapels, the Guarena palace and the Hagar Qim and Mnajdra Neolithic temples, as well as the Qrendi potato fields and environment, are evidence of the beauty and charm of the locality.